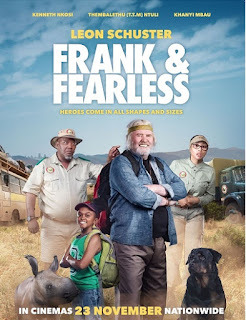 Leon Schuster’s latest movie Frank and Fearless contains a strong message against rhino poaching in Africa. A ten-year old rural boy named Fearless (Themba Ntuli) makes friends with a baby rhino (Reini) at a sanctuary near his home. One day he is devastated to discover that Reini’s mother has been shot dead by poachers for her horn. He explodes with fury and determines that he will get to the country of Nambodia, to which the horns are being exported, and put a stop to the slaughtering of rhino once and for all! At the same time, a railway chef on the Shozoloza, Sonny Frank (Leon Schuster), is getting into trouble - as usual. He is accosted by the head game ranger in the same sanctuary for stealing plants. These plants are actually herbs that Sonny needs for his work and he has a permit to collect them but the game ranger (Dolf) foul-mouths him and vows to bring him down. This hate relationship is the cause of many hilarious action scenes in the movie. Sonny gets fired for abusing a diner and while he is wandering around town wondering where to find another job, he meets Fearless. They decide to head for Pretoria to follow their individual needs – Fearless to the Nambodia Embassy and Sonny to apply for a chef’s job on Rovos Rail. The synergy between the two actors is very strong and they have some excellent scenes together. Ntuli’s final scene where he apologises to Reini for mankind’s abuse of the animal world is extremely touching. The other two main characters are Fearless’s handsome dog, Dog, who travels with the pair on their hectic adventures and a beautifully-handled puppet rhino who breaks free from its sanctuary and joins the journey. Kenneth Nkosi as the dubious character Dolf puts in a strong performance, as does David Dennis as the Nambodian Ambassador and Jennifer Steyn as Sonny’s love interest. Khanyi Mbau is a delight as Beauty, the extremely short-sighted assistant game ranger. Energy abounds throughout and there are some splendid action shots. However, there are also some fairly crude scenes which could have benefited from tighter editing although the audience loved them! The wild life photography is very impressive with delightful close-ups of animals seemingly responding to the various actions, adding much humour. High-tech 3D animation is by Luma Creative Studio, animatronics by DreamSmith and special effects by Refinery. Frank and Fearless is written by Gray Hofmeyr, Leon Schuster and Geoff Newton and was created by a team of experts, with Gray Hofmeyr as director and André Scholtz and Menzi Thabede as producers. At the opening in Durban, Schuster described the film as “a family movie with heart and lekker slapstick comedy.” However, the sincere and powerful conservation message woven into Schuster’s usual hilarious mayhem must surely be rhino conservation’s strongest voice to date.